Interests - Likes superheroes, Stoke City, Lego, Star Wars especially Darth Vader, Moshi Monsters, Avengers, Skylanders, Hot Wheels, Hexbugs, Disney Infinity (Wii game), craft, reading, tractors, farms, theme park rides and eating out, Match Attax, Alien Attax and Force Attax collectable cards. Of course the bully didn’t exist and at the beginning of December our local GP, one of many medical heroes we have met along the way, sent Kyle immediately to Birmingham Children’s Hospital following a hastily arranged blood test. Within a couple of days we were sitting in a small private room receiving, in all our lives, the worst possible news that Kyle was to receive 3 years of treatment, during which time he may not survive, he may not get better, but he was definitely going to have many ups and downs in a rollercoaster of a treatment plan. However thanks to some amazing leaps forward in treatment since my nana died of leukaemia in the 1950’s the odds for success are very good. We have discovered that Kyle is brave, high spirited and very comical, and he has kept our family sane throughout the first 6 months of treatment so far. His twin sister has also found great confidence and coped exceptionally well with being split from her brother and mum for the first time since they were born and has been very caring and understanding when he has been very ill from the treatment. August has seen the start of his second bout of intensive chemotherapy, with the steroids course he is taking causing the most insatiable appetite. This weekend he has (amongst other meals and takeaways) devoured over 60 tinned hot dog sausages and 10 family bags of microwave mash (we sound like bad parents but trust me when I say when a child is on steroids he knows what he wants and woe betide anyone try to suggest anything else). Of course, Kyle and Lydia are on their summer holidays, with Lydia desperate to go somewhere but most days Kyle just can’t rouse the energy, so they are both a little frustrated. Again though, Lydia has been understanding and started to paint and paint and paint, with Kyle picking up a paintbrush, doing a few strokes, and then retiring to a chair to watch his sisters art work flourish and be glad she is there with him. We have decided to move Kyle on from Post Pals. Both Kyle and Lydia love to receive their post from Post Pals but I have said that now that Kyle isn’t on his treatment that we should let other children who are going through the toughest times get the mail instead. We really have had 3 very supported years from everyone at Post Pals and the Post Pals team themselves, I have a huge box full of every letter and card that they have received over the years and we sometimes have a look through and remember how they helped us in the darkest hours. Thank you for everything and we hope to see you at the Post Pals party this year. Kyle and Lydia’s Christmas was excellent and Post Pals made a huge difference, with loads of cards, letters and gifts from the reindeers and Santa’s Elves. Sandwell Academies pupils chose Kyle and Lydia again and the thoughts and effort that went in to the gifts and handmade cards was amazing. The twins are still getting hours of fun out of the gifts. New Year was a little tougher with steroids for Kyle and his now usual Highlanders Broth feeding frenzy! We also had nana with her foot in plaster to live with us for a bit. The end of January was a landmark for us all as it was the last chemo and steroid in Kyle’s 3 year treatment for Leukaemia. Although a bout of croup for Kyle nearly put a spanner in the last part of the treatment, an extra dose of steroids saw him through! Now Kyle will have monthly blood tests for 12 months to check no Leukaemia cells re occur, then these will become less frequent for the following 4 years, every landmark bringing the odds of reoccurrence down. Following 3 tough years, we are left with a very brave Kyle and Lydia, a firm family resolve, amazing Post Pals, both great and some not so great memories, 48 tins of Highlanders Broth, 8 tins of hot dog sausages and 3 bags of microwave mashed potato. One month on from end of treatment, it is great to see Kyle get bigger and stronger everyday, less and less reliant on his buggy, and even biking a little further than ever. He has a rash over his face and body, but we are assured that this is normal as the chemo toxins leave his body. November was the usual roller-coaster month beginning with steroids, which this time brought its usual food cravings, with Kyle polishing off 9 tins of Highlanders Broth and 6 steak slices a day, with meals in between! Kyle has also had a bad cold so we have been on red alert monitoring his temperature to ensure that it didn’t turn into something more serious. Both Kyle and Lydia have received loads of cards and letters towards the end of November, again from all over the world including a letter from Mrs Santa Claus! Kyle has continued to enjoy the letters independently as his reading improves and has had great pleasure reading his regular farm updates, mail from Israel, reading many messages from children from other schools sharing their support, hobbies and interests amongst many other supportive messages. Kyle has also received a gift for Christmas, which when he opened the parcel and saw that it was gift wrapped insisted that it had to go to Santa for Christmas Day. I’m sure that when I was 7 there would have been no way I could have resisted ripping open any parcel put in front of me but I guess he has built up a lot of patience during his 3 years of treatment!! With his continued determination, Kyle has started to play football one evening after school. It is tough for him and mostly he stays in goal as he struggles to run around for the hour, but it has been great for him and so far he cannot contain his excitement every time he comes home from his game. He tells us about every kick, save and incident of every game, his only frustration is that he is unable to run as well as the others and told me that if he had a super power it would be to run super fast as he doesn’t like to be the slowest and then he would also be able to do the cross country with his sister (typically Lydia can run like a whippet!). We were unable to get to an organised Fireworks display this year with Kyle’s cold so we had some friends around and the kids watched me set off a box in the garden and we all had great fun watching these and eating burgers. Excitement is building for Christmas and as we are painting ceilings and walls in the living room Kyle and Lydia decided that they would set about putting the Christmas decorations in their bedrooms and much fun was had. October has seemed like a long but mostly enjoyable month. Thank you to all of Kyle’s and Lydia’s Post Pals who have provided a lot of letters and cards for Kyle and Lydia, again from all over the world including Australia, USA, Canada and Israel. Kyle has become more independent with his letters and is really enjoying learning all about different countries, farming, and this month lots of new history about ancient Egyptians! Kyle has been to a couple of Stoke games this month and is enjoying seeing a more exciting style of football this season but unfortunately with little reward so far. He has become a keen collector of Match Attax and is learning more about other football teams. We took him to the Arndale Centre in Manchester on Monday where they had a Topps Festival including Match Attax and lots of other collectible cards. He had a great time collecting some free cards, swapping his doubles and playing against the Match Attax ‘Master’ in an attempt to win a limited edition card (unfortunately the ‘Master’ was a little better than Kyle and his dad!!). The down side for us was that because they were giving away different collectible cards he has now decided to start to collect Alien Attax (Doctor Who) and Force Attax (Star Wars). I presume this is Topps desired result in giving away a few taster cards!! However we had a great day, we were there for hours swapping cards and getting close to having all the Stoke players! Kyle has also finally started to swim without floats and Lydia is not far behind now. In terms of treatment, he has had his penultimate Lumber puncture, which he took in his stride and steroids week was another odd one as yet again he had a tough couple of days with no particular food apart from his Highlanders Broth staple diet and Crunchies!! Yet again he has his ceaseless and uncomfortable cough which he never seems to be free from but again he gets on with it without any complaints. Back to school month has been very good, Kyle and Lydia have settled in with their new teacher and are really pleased to be back with their friends again. Their mum took them to our local shopping centre to meet Peter Andre, who was promoting his new perfumes in Stoke! The feedback was that the only person to be really impressed and star struck was mum, Kyle and Lydia were not too impressed! We visited the Museum of Science and History in Manchester with friends and we had a great time exploring and getting involved, we even made a short lego animation. Steroids arrived in the middle of the month and Kyle tried hard not to let them beat him but he could not make a full week in school and spent the Friday resting and recuperating with his nana. He picked up a little for his cousins seventh birthday though soon ran out of steam as the party went on, but even then it didn’t spoil it as he just sat and watched the other kids play. As soon as Sunday arrived and his last dose of steroids had gone, he started to come back quickly, and we visited Gladstone Pottery Museum – we had a great time spinning a jug and discovering the history of toilets!!! This weekend we went conkering, I was amazed at how many huge conkers were just lying around, when I was a kid we had to work hard to get the best conkers from the tops of the trees with a stick. I guess there are too many exciting things to do these days before collecting conkers. Kyle and Lydia have both enjoyed reading their regular updates from Dottie and the farm. They have also received a couple of really nice home designed cards too. August was (as with most months) a very mixed month with Kyle and his well being. He started the month with pneumonia and spent time in hospital on an antibiotics drip and was taken off his medication for a few weeks whilst his immunity improved. 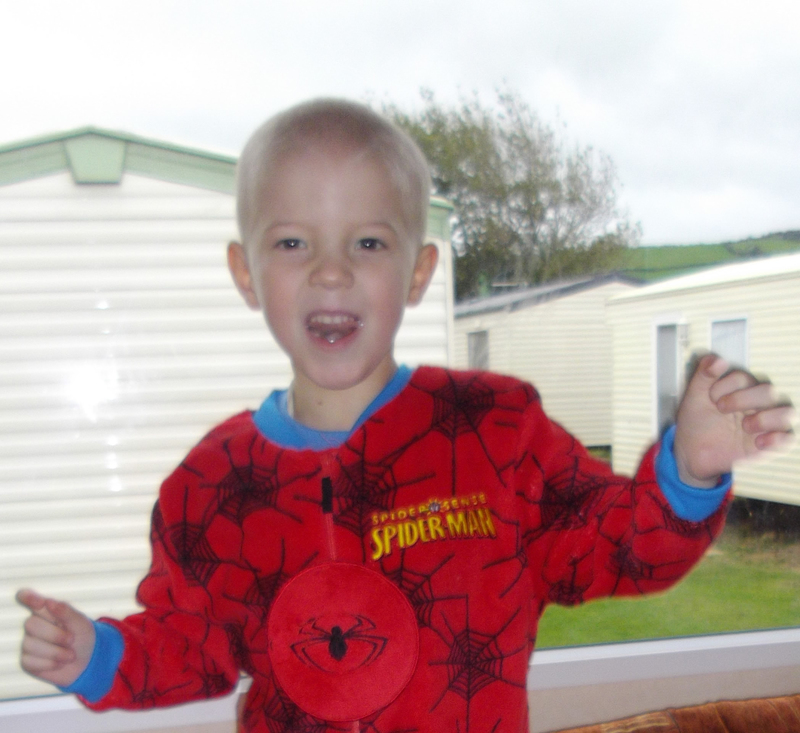 Although, whilst he was poorly and in hospital it was a difficult time, when the antibiotics had cleared him up he was on top of the world, mainly because the side effects of his treatment had lifted and he was more mobile and had significantly more energy. We are all hopeful that we will see the end of Kyle’s lengthy treatment in April next year, so it was a real insight to see what a different child Kyle will hopefully become. This lasted 2 weeks in total before he was introduced back on to his full treatment including his lumber puncture and steroid course. It was not all bad, as although his side effects returned, he was still very upbeat as we spent a week on the Isle of Bute in Scotland for our holiday. It took his mind off it all as both he and Lydia learnt to ride bikes without stabilisers for the first time!! After this breakthrough we couldn’t get them off them during the holiday and he was able to ride the bike better on the flat than he is able to walk! Steroid food for the week continues to be Highlander’s Broth, but fortunately we took a sack full with us and they lasted until his steroids were over for another month. Kyle and Lydia have been really happy receiving some lovely individual postcards over the summer with some real efforts put in to all the messages and drawings. They also received sticker books of their favourite characters that have come in handy for the hospital visits lately as they have both had to go as it has been the summer holidays. Kyle and Lydia have just one more weekend left of what has been overall the best summer holiday since his treatment started and so far they are all prepared and ready to go back to school to see their friends and see what exciting subjects Year 3 brings. June saw Kyle and Lydia celebrate their 7th Birthday, thank you to all their Post Pals around the world that sent them numerous cards, they really enjoyed opening them and reading them all and putting them up around the house! As Kyle was due to be at the height of steroids on his birthday, they had their party the weekend before. Kyle had a great time with his friends discovering bugs at his bug party and Lydia created lots of fairy items with her friends at her fairy themed party, both at a local Wildlife Trust site. Kyle had a rough ride in steroid week, so we were glad to have celebrated his birthday early. Again, no particular steroid food, but amongst eating lots of everything he devoured over 25 Crunchie chocolate bars, which was unusual as he usually goes off chocolate and sweets altogether! We had a little break in South Wales at the end of steroid week and it quickly picked Kyle back up and we all enjoyed a great time visiting some great places in and around Tenby and Saundersfoot. One of the highlights for Kyle and Lydia was learning all about owls and getting right up close to a barn owl. We went into the month of May very cautiously as it was the month of the Lumber Puncture, however apart from a day of sickness (unrelated to the Lumber Puncture) Kyle has been quite chirpy. He picked his steroid old favourite of Highlander’s Broth (for which we have to scour Stoke on Trent’s B & M shops as they are the only shop that appear to stock it) very early and also seemed open to a variety of other foods alongside this. So whilst devouring up to 8 tins a day he would also eat burgers and dinners in between!! All the food seemed to keep his strength up to enjoy things more, he still found walking hard work so we had to use his buggy and my shoulders to get him around but his mood was very positive. Kyle and Lydia have really appreciated the many early birthday cards, a lot from schools and other clubs, which the children have put in loads of efforts to capture their hobbies and interests very well. Another mixed month for Kyle. It started off great which was really lucky for us as we managed to get the absolute maximum enjoyment from our Easter break to Blackpool. It was not the best weather but with no rain we could cope with the ridiculous winds! His favourite day was the Pleasure Beach and especially the rollercoasters that he is now just tall enough to ride. We had to go on the Grand National 3 times – I sat at the back with Lydia on the third ride and I really thought she was going to fly out of her seat, whilst I panicked and held her tight she just took it in her stride and giggled! I had a call from the Blood Donor magazine in the middle of the month, they are putting a letter I wrote to them encouraging them to use Social Media like Facebook more to drum up customers and they wanted a photo to put with it. I only started to donate after Kyle had made a lot of use of blood and platelets following his diagnosis, I just wish someone had encouraged me earlier as I feel I have wasted years of being able to help and support people who rely on the donations to survive. It does appear that they took notice of my letter as I seem to have every other alert on Facebook as Blood Donor information and they now have over 250,000 like’s! The rollercoaster of a month came to a sudden dip with steroid week, strangely Kyle didn’t settle into a food and really didn’t eat a great deal compared to normal steroid weeks, he dabbled with previous favourites like Steak Pie, burgers, mashed potato. I think that was where the problem lay as the food seems to build him up to help him through the week. As it was, he was left very weak and pail throughout the week and just couldn’t make it in to school for the last couple of days. We had tickets to Stoke v Norwich that Saturday, which he insisted he wanted to go to so I took him fully prepared to bring him out if he was not up to it. He wasn’t too good but managed to get through the first 20 minutes, then he said he was tired and just wanted to rest his eyes for a few minutes – an hour later he woke up and asked if it was half time yet. I have no idea how he slept through the singing and celebrating that was going on all around him, he was very chirpy following his nap especially as Stoke managed to hold on for a much needed 3 points! Steroids ended Sunday and by Monday he seemed to pick straight back up, he read his school book and we then had to read some pages in a Star Wars Annual he had from a Post Pal at Christmas and was very chirpy! Steroid time again and the food of choice is Steak and Kidney pie, we have a fridge full of pies which without the influence of steroids he wouldn’t entertain eating, but is putting away 7-10 a day!! It is the start of the Easter holidays and we are hopeful of a little better health for Kyle, it has been another tough one with coughs and sickness, resulting in a weekend stay in hospital for a course of antibiotics. It has been a while since he’s stayed in for that long and although it was tough, it was good to see all the nurses and staff who were amazed to see Kyle with hair and a lot more grown up. Hospitals can be very boring, especially at the weekend when all the good toys, craft and consoles are locked away when the play specialists are off, but yet again the Post Pals craft and books really came to the rescue! We are planning a caravan stay at Blackpool for the second week of the holidays as long as Kyle is ok and as long as snow doesn’t mess up those plans. I’m hoping the country gets some well earned good weather but I’m not too hopeful. Kyle and Lydia have both had some lovely Easter cards and letters, Lydia loves a princess pencil set she has received and Kyle has for the first time, without any help, built a lego set he received. He was over the moon. Kyle’s had his toughest month in a long time, he’s had a bad cough, sickness and temperature on and off all month, but as usual he has battled his way through, helped with a lot of great post. He’s had amongst other post, Where’s Wally postcards, a late great Christmas package for all the family with his regular farm mail and updates from around the world. His January steroids had a late steroid food entry of chicken and mushroom pasties, and in his last two days he polished off 15 Ginsters specials!! We are as usual in the middle of steroids as I write and as usual he has chosen his random steroid food, which resulted in an early morning trip to the shops to pick up 6 packs of Staffordshire Oatcakes. To those outside of Staffordshire who have not been lucky enough to hear of this delicacy, Oatcakes are a similar size and shape of pancakes, like a flat frisbee, but are a savoury oat taste, best eaten rolled up filled with a variety of fillings but Kyle has chosen just cheese. Half Term holiday came in the middle of the month for Kyle and Lydia but with Kyle off colour we had a lot of home days, again still having hours of fun with the various gifts that Sandwell Academy children sent them for Christmas, they’ve never coloured in so many Moshi Monsters!! Moshi Monsters was the big event of Half Term with Kyle pushing himself to the limits to drag himself through a tough but great day at Alton Towers which brought together two of his great loves theme parks and Moshi Monsters who made an appearance at the park during half term. At times he really struggled but never gave up and found a new favourite ride in Sonic Spinball (he has just reached 1.2m, the minimum height), Kyle and Lydia loved it, but nana and dad had to be dragged back on after nana nearly collapsed the first time!! Kyle and Lydia have spent the month discovering all the great gifts they received from Post Pals at Christmas and also catching up with some of the cards and letters they received too. Both of their reading has come on and it has been supported by the cards, books and letters they have received from Post Pals that they have been determined to read themselves. Most of the month Kyle has stayed a little bit stronger than of late and it meant we were all able to really enjoy the snow, making snowmen and sledging. It is the first snow he has really enjoyed, because since he has been old enough to enjoy it, he has not been well enough. It brought back a very sad memory for me of when it snowed in December 2010 and I took Kyle and Lydia out to sledge, we hadn’t gone far and he started to moan and cry. I called him a wimp and sent him in to his mum, whilst I took Lydia out to have fun sledging. Three days later he was in hospital and we learnt of the drama that was to unfold for him over the next three years of treatment. I have never forgotten how guilty I felt and will remember the day I called my brave, strong boy a wimp forever. However it is great to see that although he can still get very ill with the treatment that in between times he shows signs of being stronger. As always with the monthly update this week is steroid week and it is a bit of a funny one as he doesn’t seem to have a ‘steroid food’, if anything he is a little fixated on food he normally cannot stomach. He is eating a lot of sugary foods, unlike his usual savoury foods, things like Rice Krispies and Ginger Nut biscuits, very strange. He’s also been very poorly and although he has tried, he had to have a day off this week, he was just too exhausted, he couldn’t even stand up properly. He’s had dark rings around his eyes and when he hasn’t made it to school or when he’s come home, he’s slept. December started with the usual bad cough following Kyle’s chemo injections and his steroid week and we’d been through an entire supermarket chains stocks of macaroni cheese during the steroid week itself. Every day of December was special this year with some amazing Advent gifts in the Advent gift bags they both received, they were amazing!! Both Kyle and Lydia had put in great efforts as a camel (Kyle) and a sheep (Lydia) in the school Nativity, as we expected the camels were the comic characters in fitting with Kyle’s personality! Throughout December Kyle was gradually lifted by all the wonderful cards, letters and gifts from all over the world again, including for the first time, Israel. I was contacted by a teacher from Sandwell Academy to say that her pupils had chosen to be Kyle’s elves and could she drop some gifts off to save paying a big delivery charge. My mum gladly agreed to make herself available to take in the delivery. A couple of days before Christmas I had a very excited mum on the phone saying that her flat had been filled by the delivery!!! I didn’t quite take this in until I went to pick them up and I filled my car and had to make two trips as I could not fit my mum in the car! It took Kyle and Lydia over an hour to open all the wonderful and imaginative gifts from all the pupils who had bought gifts to fit all of their interests. It then took another hour to read all the lovely creative and artistic messages and cards from the pupils to Kyle and Lydia. This week is yet again steroid week with cheese and Jacob’s Crackers being the food of choice, he has as usual been very poorly, but as he is still off school and he still has loads of his gifts to play with and create with he has handled it far better than usual. I hope everyone has had a great Christmas and New Year, thank you to everyone who has lifted us throughout December and into the New Year! Steroid food was a bit of a mix last month with microwave mash just topping the demands throughout the days and nights. This week is again steroid week and the mystery of what will be on the menu means we have cupboards of Highlanders Broth, Hot Dogs, etc. Kyle also had his chemotherapy lumber puncture. Kyle seems to handle this minor procedure better every time he has it and although he missed a day of school for the procedure he bounced back for the next day and still continues to enjoy every second of school. His bloods came back as having very low immunity in the middle of the month, so he had a week off his chemo whilst they recovered, and fortunately he managed to get through without picking up any bugs and actually had one of his best weeks since before Leukemia. Kyle and Lydia’s Nativity rehearsals are ongoing and they are both very excited to play their chosen animals, Kyle as a camel and Lydia a sheep, and we can’t wait to see the show. We also had Parent’s evening and were very reassured that although Kyle is behind due to missing most of his first years of school, he is really working hard to catch up this year and Lydia is helping him to do this. Kyle and Lydia have already started to receive some Christmas cards and they were very, very impressed yesterday to find they had received a very special Christmas bag each which had been made up with great care and effort to include a gift for every day until Christmas Day like a big Advent Calendar! We are the eve of steroids again and the mystery of the food fad of the month will be discovered in the next day or so, rest assured we are stocked up on soup, pies and hot dog sausages just in case. He’s had his monthly steroid injection and was asleep by 7pm, hopefully he will have a good night and wake up a little better tomorrow. On the whole he has had a good month, for the first month in what seems like forever his cough has been a little easier and that has helped him cope with everything a lot better. We went to Warwick Castle for Halloween, which was scary but a lot of fun too, they especially enjoyed the Mad Professor making snap bangers with his science experiments. We went to a local bonfire and the fireworks were brilliant, Kyle stayed awake on my shoulders all through it, the last couple of years he has not been able to stay awake and we’ve ended up covering him in blankets in his buggy. Steroid week was tougher than usual this time, Kyle always has a few days of itchiness but usually a bit of Piriton and cream and he is ok again. This time, the Piriton and cream just wouldn’t work and he was itching so hard he was cutting his skin, it was an upsetting night and he ended up in hospital and had very little sleep but eventually we got it under control. His food craving of the month was meat and potato pie, with him demolishing at least 10 a day!! Unfortunately we have cupboards full of 25 Highlanders Broth soup from last month, as this craving did not return (looks like dads got his lunch sorted for a month!). At the end of steroid week, Kyle went to his first football match this season, Stoke vs Man City, his highlights were having 2 meat and potato pies and chips and he found it tough going so we had to leave just before the end. Once he was home and relaxed he told his mum how much he had enjoyed it and was keen to go again and Lydia would be able to enjoy a girly day again with mum. Post Pals introduced Kyle and Lydia to Moshi Monsters and they have both started to really enjoy the Moshi Monsters on the computer where they can have fun, learn and make friends. We entered one of the competitions in one of the magazines that Post Pals sent to Kyle and Lydia and they have won a Moshi Monster Moshling Guide! They were really excited to receive the books in addition to the lovely letters, cards and gifts from Post Pals. With the first month of Year 2 completed, apart from the day after the itchy night and a few hours for hospital appointments, Kyle has been able to attend school more than last year, this has been great for him to mix with his friends and he is slowly but surely catching up with his sister. They have both improved their reading which has been helped with trying to read the cards, letters and books received from Post Pals. The Space subject has really gripped them and every spare moment, Kyle is painting or drawing a space picture or telling anyone who will listen about planets! Not much sun this summer holiday but Kyle and his sister, Lydia, have enjoyed it thoroughly with a mixture of days out with mum, dad and grandparents. Steroid week came in the middle of the holidays which was tough for us all but without having the complications that comes with trying to keep up Kyle’s school attendance it was a little easier. Steroid food for this week was Highlanders Broth (no other variety would do), he was having 10+ tins a day and we were clearing shop shelves and really struggling to keep up with his demands (no thanks to grandparents introducing him to it on one of their days). Last week saw the start of a new year at school, year 2, typically his lumber puncture coincided with the day before they were due back, all concerns were unfounded as he sailed through it and has thoroughly enjoyed learning about space at school, which is the theme of this terms subjects (I must admit I am quite enjoying it too!!). Tomorrow is the start of another weeks steroids – we’re hoping for a smooth week but as there will be no respite I’m sure it will be a little more tough than in the summer. We have 25 tins of Highlanders Broth on standby but I will be surprised to see the same craving for food repeated, fingers crossed for a simple and cheap craving! Kyle’s blood counts and chemo intake has been up and down in May but he has mostly stayed out of hospital and was able to enjoy a lovely family holiday in Wales at the beginning of June. We managed to avoid the floods and some tree falls of mid Wales and arrive on the Pembrokeshire Coast. As he was feeling a little better and doing his best to impress his Auntie and cousins, he managed to stay very up beat and cheerful throughout our stay. However, with his birthday coming up, he had his Lumber Puncture on Monday 18th June and was put back on the steroids. He’s a little bit under the weather but we hope his birthday party on Saturday will lift his spirits with all his friends and family around him. Yet again he and Lydia have been receiving letters and some great postcards from all over the world! We are also having updates on all the goings on down at the farm throughout the seasons and I am getting just as much enjoyment from the exciting updates as they are! Kyle and Lydia are both getting a little better at reading the letters and cards but we are still having to read most of the longer letters and I really believe receiving all of the letters and postcards encourage them to learn. Some of the books have been really great too and have made it in to their favourite books choice, especially a great and very real story about a twin boy and girl. I can’t wait for the next update to let everyone know their reactions to their birthday cards and presents that they have been sent by Post Pals. March started off with Kyle’s continuing cough and temperature meaning he was in and out of hospital on various different antibiotics. One thing that kept all of our spirits up was a great amount of Post Pals messages, by email, postcard, letter and gifts, yet again from all over the world, which is really encouraging Kyle and Lydia to learn about different countries! Whole classes from several schools have sent Kyle some lovely messages about how they have very similar hobbies to him with drawings of their favourite characters. It was wonderful to hear both Kyle and Lydia give out full belly laughs when they received a Whoopee Cushion through the post, the fun lasted for days! Kyle’s favourite gift was an amazing canvas painting of Darth Vader that arrived all the way from Australia! It was great for him to be the featured Pal on the website and to see himself on the front page whenever we went to the Post Pals website and the bumper messages have really helped to bring Kyle back to his best with a much better end to the month and no further hospital stays in the run up to Easter. Thank you for all the mail, it really lifts our moods and aids Kyle’s recovery when he is feeling low. Other than a tough week on his steroids, with his anger, sorrow, tears, laughter and his insatiable appetite, February has been another ok month for our brave little boy. He has now been prescribed an inhaler which is keeping his (what seemed like never ending) cough at bay, yet more medicine that he has added to his regime. Two years ago I watched the Phantom Menace with Kyle and Lydia on video for the first time; they soon became hooked just as I had at their age. Kyle asked if he could go and see it at the cinema like I had with my dad, he was very disappointed when I told him that they don’t put older films back on the cinema. Two years on when I took him to see the Phantom Menace in 3D he truly believed that they had specially put it on for him!! He didn’t move a muscle and watched every second with complete concentration; I cannot thank George Lucas enough for such a special moment. January started well with the New Year and post Christmas glow for all of us. Kyle continues to brave his needles and is getting more confident with them and knows that they are necessary. He has mostly been well through January apart from a constant cough, however the end of January has seen a bacterial infection combined with a viral infection crossed with concerns of what would be very serious for Kyle, Chicken Pox going around his class!! All have resulted in delays in his chemo and steroids and taking 3 different types of antibiotics to relieve his infections and to keep the Chicken Pox at bay. With all of Kyle’s various ailments we had forgotten Lydia could also be poorly as she seems to have the immune system of an ox, but just as Kyle was at his worst Lydia had an ear infection with compacted wax, for her another type of antibiotics and hard of hearing. As always she was more than willing to take the back seat and make do whilst Kyle required the focus of attention. With the reduced doses of chemo, Kyle’s hair continues to grow back really soft and with little waves, his mum can’t wait to have it cut, but I on the other hand want it to just grow and grow after so long with no hair at all. So far I am winning and he also wants it to grow longer. We’ve had loads of parties for school friends birthdays this month too and so far we have made all of them and it has been good to see them both mixing with their school friends after such a stop start year with school last year. I bought tickets to Wrestling in Manchester at the end of January but we were not able to make it as Kyle had been in hospital in the day and although he came out he was not quite up to a long night of it. I was a little optimistic to think we would make a late night so we will be sticking to local wrestling for now, no Hulk Hogan appearances but at least its great fun and less traveling and earlier nights. Kyle and Lydia have had some lovely letters this month including some letter packs from schools and they have enjoyed hearing about other childrens hobbies, lives and religions, and I have learnt a lot too. December has been an excellent month, Kyle has been more enthusiastic and not letting his treatment get him down as much. However without his central line, although he is being very brave, the constant injections and finger pricks are his biggest concern – being able to swim and have proper baths again do not quite make up for it apparently! For the family, the one week of steroids each month remain the hardest part. Kyle becomes an emotional eating machine and Lydia finds it difficult to understand the changes in him. This was not helped when the fridge freezer broke in steroid week just after Christmas – we are set back up now and thanks to some helpful neighbours we could still have his frozen meals on demand in the interim. The best part of the month was of course Christmas and Kyle and Lydia have enjoyed a lot of cards and letters from all over the UK, USA, even ones from the Netherlands and a lovely card for Lydia from Tokyo! They also received updates from the reindeers, Dottie the Dalmatian and presents from Santas Elves. I saved up the gifts for the big day and Christmas morning was doubled with the extra gifts. They loved every single one and are still enjoying the great presents – I really enjoyed making a plaster Ben 10 with Kyle painting him very well. Lydia loves her new Barbie and she now spends ages searching for videos of her on youtube! The month and the year didn’t end quite as high with the broken fridge freezer and two nights in the hospital on the antibiotics following Boxing Day to control his spiked temperature – it had been a while since a hospital stay and needless to say he was anxious to have the cannula removed. They are back at school again now and we all continue to help Kyle catch up with the missed days at school, which probably would not seem as bad if his twin sister wasn’t so far ahead of him, but she tries her best to help him too. Thanks to all Kyle and Lydia’s Post Pal friends for making this Christmas so much more enjoyable than diagnosis Christmas last year. We hope our (and everyone else’s) 2012 is a good year. Apart from a cough that Kyle has had all month, which has worn him out, it has been a good month for him and the gifts, cards and letters, which Kyle and Lydia have received, have continued to really lift their moods. Kyle and Lydia remain fascinated with hearing about where the letters and gifts are from and hearing everyone’s stories and seeing some really nice scenery photos. 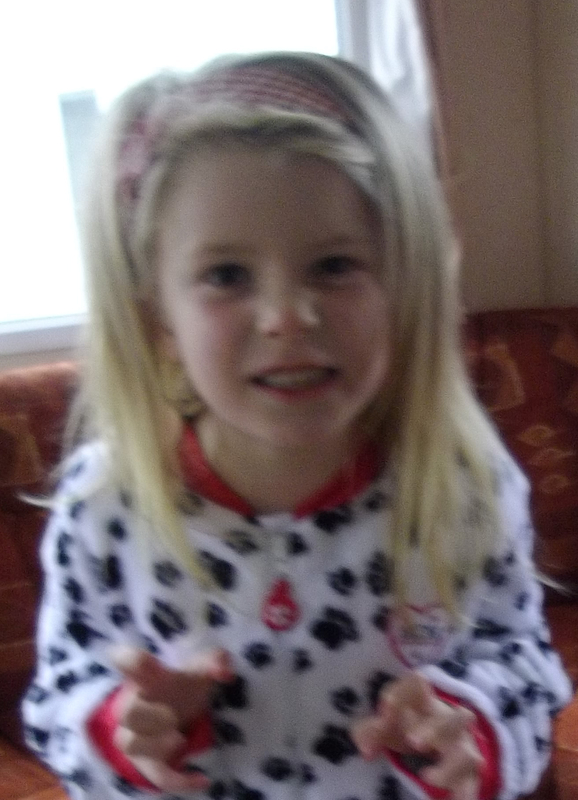 They also received one of Dottie the Dalmatians soft toy brothers who Kyle has named Fluffy Darth Vader and we have been following Dottie’s adventure in Lanzarote and the adventures of his other brothers and sisters, which we have received regular updates about. Kyle has received a Darth Vader costume and he wears it before and after school, we struggle to get him out of it and I have been on the receiving end of Darth Vader’s ‘force’ many times this month! Thanks also for Kyle and Lydia’s new pillow cases which they absolutely adore. School is still going very well and Lydia continues to support Kyle in catching up after missing big chunks of Reception year and her support really encourages him to do well. They had a great half term at the end of October meeting up with their old nursery pals and relatives. We took them to Drayton Manor Park at the end of the week and they watched an amazing fireworks display after riding the new Ben 10 ride in the dark, a great day but all too much for Kyle as he fell asleep half way through the fireworks!! With all the music and bangs I was amazed that he managed to fall asleep at all. September started with a delay to Kyle’s treatment due to his counts not recovering quickly enough, but he bounced back within a week and the remaining part of the intensive treatment has thankfully gone well. So Kyle is now officially onto his two years worth of maintenance which hopefully will be a little easier on his little body. Kyle and Lydia have received some fantastic letters, cards, emails and gifts this month, which has meant Kyle has had plenty to do to keep him occupied on his boring days in the hospital. Kyle has also had great fun sticking glow in the dark space scenery on his wall and enjoys looking at them before going to bed. Lydia loves all the letters she receives and every weekend she wears the bracelets and necklaces that have been made for her. They both enjoy sitting listening to the lovely words people send and what is going on in other people’s lives, they are keen to hear where people live and were most excited when we received a card from Nashville in the USA!! Also, this month has been back to school for Kyle and Lydia and they have settled in to Year 1 well. Kyle has only missed a couple of days with treatment which has pleased him to spend more time with friends. Both of their reading is going well and I am encouraging them to use their phonics to read bits of the cards and letters they are getting. They have never coloured in and played with craft as much since joining Post Pals and they are becoming very creative with it all. The second half of August has been a real mixed bag. Kyle has finished his current course of steroids and his diet has crashed from 30 hot dog sausages and mash to match to almost nothing. He spent a few days in hospital on antibiotics to get him through a bad cold and of course the intensive chemo continues with day trips to the hospital and the district nurses coming out most days to put it through his central line. It sounds doom and gloom but beside all of that he has kept very high spirits, thanks in the main to sharing all of this with his sister as she is usually at school whilst he has gone through it all. They have supported each other and have made the most of any day trips that don’t involve a hospital. Kyle and Lydia are new to Post Pals but have had their spirits lifted by receiving some lovely letters and cards and they have enjoyed hearing about other peoples lives and hobbies. He particularly enjoyed colouring in some Darth Vader pictures he received!